Chiltern Mainline on the West Coast Main Line! Former WSMR 67014 "Thomas Telford" is at the head of the first set of Chiltern Mainline branded silver coaches with DVT 82305 on the rear of the five coaches, as they pass Cheddington Station. This train, 1I28, was a charter from Birmingham Moor Street to Wembley Stadium for the Community Shield match between Manchester City and Manchester United. Departing from Moor Street at 09:03, the journey was somewhat complicated by engineering works on the Chiltern line, not due to be completed until later in the day. Thus the train ran via reversal (three times!) at Leamington Spa, reversal at Coventry and then up the WCML to Wembley Central. Then a further reversal at Mitre Bridge to Willesden No. 7 for another reversal to Acton Canal Wharf. Here the final reversal took place and the train then ran via the Neasden Curve to arrive at Wembley Stadium from the south (actually, east! ), where it was due at 12:14. The return train was due to run via the normal route to Moor Street after the match. 11:08, Sunday 7th August 2011. In the event, the train did not get to Wembley Stadium due to constraints over the use of the projected route. Passengers were detrained at Harrow & Wealdstone to continue their journey by LOROL to Wembley Central. 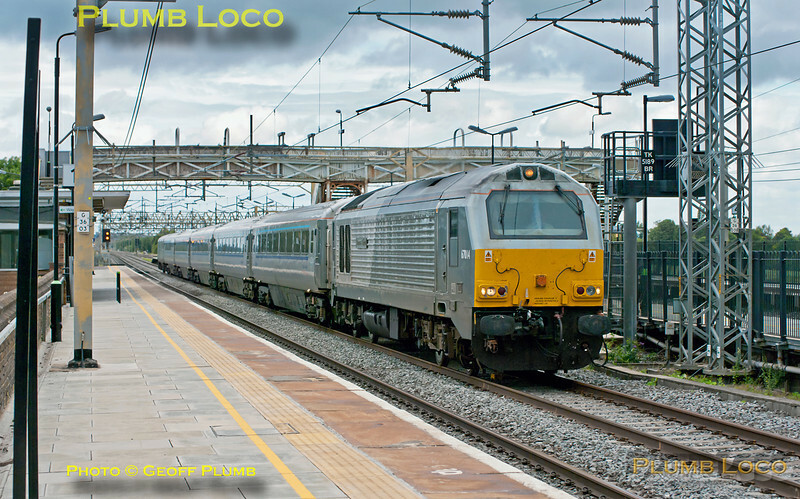 The ECS of the train was then due to stable at Willesden TMD, but was able to run as ECS over the original route, so ended up in Marylebone until required for the evening return run... Digital Image No. GMPI9958.